Director/writer Benson Lee graduated in the 80's and was influenced by the work of John Hughes. As much fun and poignant teen movies of that time were, Asian characters were stereotyped if they were even featured. Lee took sixteen years to create this story based on his real life experiences of how foreign born Korean teens were sent back to Korea to learn about their culture. It worked up until a few years after Lee had attended and ended because the Koreans realized that those kids raised outside of Korea were just plain unruly and hard to control. 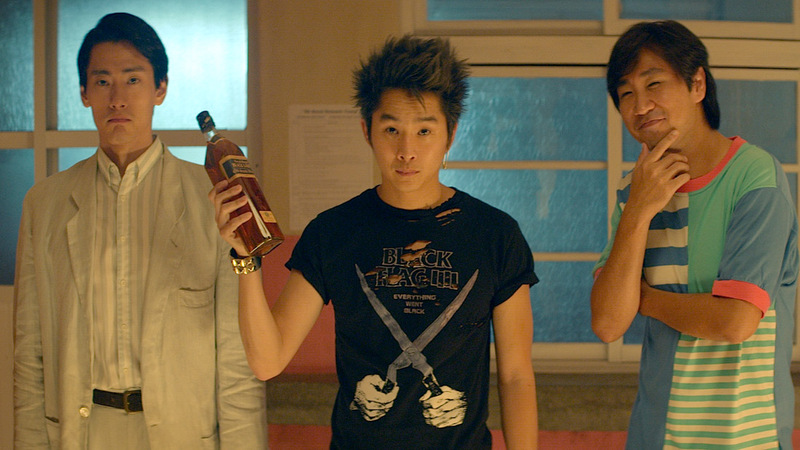 Sid Park (Justin Chon) fashions himself after Sid Vicious in his punky attire, dangling cigarette and safety pin earring. He's roomed with Sergio Kim (Esteban Ahn) a Korean-Mexican and Klaus Kim (Teo Yoo) a Korean-German. Sergio is a bit of a womanizer and Klaus is buttoned up banker to be. The boys and girls are kept on separate floors and warned about fraternization. Sergio doesn't think it will be a problem and manages to get his roomies upstairs to explore the young women like Grace Park (Jessika Van) a Madonna wanna be, Kris Schultz (Rosalina Leigh) an adoptee looking for her real mom, and Sue-Jin (Byul Kang) a tom boy who doesn't trust men. There's other characters like Mike Song (Albert Kong) from a military academy who hates the Japanese, and a trio of hip hop rappers who act like they are black (one of whom is Heejun Han who appeared on American Idol). The story flits between the various characters and their adventures at drinking, dancing and carrying on while supposedly under the watchful eye of their teachers like Mr. Kim (In-Pyo Cha). The teens are seen in their classrooms trying to take various lessons on language, calligraphy and martial arts feeling bored and somewhat disconnected. Some of the adventures portrayed are based on real life events like almost staring a war at the DMZ during their field trip. For the most part, the action revolves around blossoming romance, friendship, and personal development. All put together with an amazing 80's soundtrack and fantastic nostalgic costumes by Shirley Kurata. There's some heavy moments that will bring tears to the eyes and there's just some really fun and silly moments. It's like Breakfast Club, Sixteen Candles and Ferris Bueller's Day Off all rolled into one only this time with an Asian cast, some of whom were found by the director from Facebook. Esteban Ahn was found on You Tube. The film had it's premiere at Sundance to positive reviews in January. There are plans to start an Indiegogo campaign to raise funds for theatrical distribution. The movie is in various languages with subtitles. But the universal truths and characters are translatable to everyone no matter how old or ethnicity. A great way to start the 14th Asian Film Festival Dallas!